Adras Velae is a mendicant Chimer mage who is imprisoned in Heimlyn Keep. 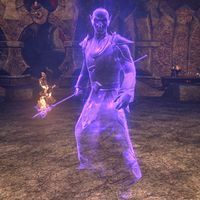 In life, he and Rendrasa Malena, devotees of the Daedric Prince Namira, created the Spellplague as a weapon against the Dwemer, but after it proved to be uncontrollable they were bound to the vault with their wicked creation. He is fought at his spell cage, and later opens a portal so you may fight Mendicant Sulinor and dispel the curse. You can speak to him after binding him. "Begone! Your living breath pollutes our bone-dry air." This page was last modified on 5 March 2019, at 23:18.